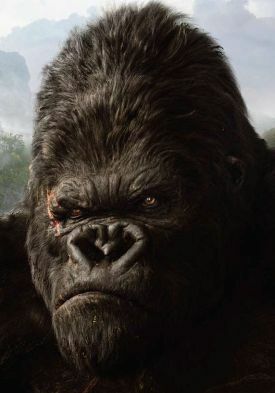 I’ve seen the new King Kong movie twice so far and I intend to see it again. I love movies, I love writing about movies, and I enjoy reading about movies. King Kong, in my opinion, is just about as good and as visceral a cinematic experience as one can hope for. It presses all the right buttons, it’s exciting, funny, scary, and touching, sometimes all at the same time. But that’s not why I’m writing this. One of the reasons I love movies is that I’m fascinated with the production process. I love watching “making of” features on DVD’s, for example. The best ones are the most technical and involve representatives of all the different parts of the crew to describe their jobs. An excellent example is the recent Star Wars Episode III DVD, where extensive details are provided about all the teams involved in the production of that historic film. Also, the extensive documentaries accompanying the extended editions of the three Lord of the Rings movies are supremely instructive about the filmmaking process. Other excellent examples are contained in these DVD’s, most of which are Director’s or Special Editions: Close Encounters of the Third Kind; CQ; Fight Club; Hellboy; It Happened Here; Jaws; Millenium Actress; Panic Room; Sin City; and Superman. To this list I’ll add the recently-released 2-DVD King Kong Production Diaries where director Peter Jackson introduces a lengthy series of short documentaries about many of the physical production aspects of King Kong. But there’s something missing from just about every one of these sources: a discussion of the project management aspects of movie production and the roles that technology plays in the management process. Where are the org charts, the team charters, the timelines, the monthly reports, the budgets, the spreadsheets, the attacking of bottlenecks, the tracking of actual versus expected? This really hit me when I was reading about the times when during Lord of the Rings Peter Jackson was actually involved at times in making three separate movies. It’s a wonder he didn’t lose weight back then rather than waiting for Kong to shrink him before our eyes! I’m not suggesting that the missing details listed above constitute “project management.” Movies by definition require a project orientation. The processes associated with production can have a beginning, a middle, and an end. The initial gestation period of ideas may last several years, but as they move closer to reality – especially when the producers and directors start talking about “real money” — the formal aspects of project management have to be defined. Key positions must be filled, schedules of busy actors with competing projects must be coordinated, locations must be secured, and talent in front of and behind the camera must be assembled, organized, and scheduled. Above all, leadership such as provided by the director is a key element in project management. For a typical project a project schedule plan is key, especially when traditional concepts of project management are considered. The plan provides both a sequence of defined work tasks as well as a delineation of assigned responsibilities. A wide variety of software packages are available to help with managing the project schedule plan, many including the ability to compare what actually happens with what was originally planned. I assume that special implementations of project management systems are available for movie and TV production; I’m just not personally aware of them. There’s another similarity between movie production and software application development in terms of how project management techniques are applied: That is, both software development and movie production require a careful mix of art and science, creativity and grunt labor. And I would assume that, as with software development, movie production management has adherents to traditional plan oriented approaches as well as adherents to more dynamic approaches such as lean or agile management techniques where the detailed plan is de-emphasized in favor of more organic or dynamic forms of management. I'd be very interested in hearing comments from folks here concerning a recent blog article I wrote that discusses project management techniques applied to motion picture production. I'm a big fan of the "making of" documentaries on movie DVD's. I've noticed a dearth of discussions of project management tools and techniques other than the ubiquitous use of scripts, storyboards, and increasingly, animatics. As a project manager who leans towards traditional plan oriented techniques, I've often wondered at the management techniques used by directors of blockbuster productions such as Peter Jackson's King Kong. In the above article I draw some parallels between motion picture projects and software development projects and would enjoy hearing comments and criticisms either here or as comments to the above article. I have been very pleasantly surprised at the number and quality of responses supplied by group members and their references to experiences and practices in motion picture, television production, and stage work. Recommendation of Rob Austin’s book Artful Making as "... one of the seminal works on Agile Management Processes." The special requirements of managing people who are accustomed to working independently. Even in highly creative activities there's still a lot of repetitive non-creative work involved. Mention that there are few places in the world where its possible to learn film production skills. Mention that the project management lore in movies is passed as "tacit tribal knowledge." A suggestion that one reason films come in on budget is that producers relentlessly cut content as the production proceeds, a practice which may or may not have a comparable situation in software development. In a discussion of management's understanding of project requirements, a reference was made to the Apollo 13 flight where an engineer's suggestion that power be cut at the end of the mission ran into the fact that electricity would be needed to deploy the landing parachutes. (January 14, 2006, by Mel Duvall). It describes how a Peter Jackson used a combination of videoconferencing and satellite communications to keep track of work going on in multiple New Zealand locations during filming of The Lord of the Rings trilogy.